In una notte di mezza estate il Castello di Contigliano si anima. This year Contigliano’s traditional re-enactment of the historic assault on the local castle, which takes place August 4-7, is accompanied by an interactive multimedia installation called II Castello Sensibile. The installation has been prepared by the Mediars Centre of Interactive Media for Art and Entertainment. The event focuses on interaction between people and public spaces, in this case the historic castle. To do this we will use a coloured light set up at a strategic site in the town, the main gate. As visitors pass through, the lights will change colour to express the relationship between visitor and castle. The colour sequences will depend on the flow of visitors: when they enter the lights will be red, when they leave green and when they stop blue. The sensors used will also reveal the number of people passing through – the more people there are the lighter the colour tone will be. The decision to use lights did not come about by chance – colours are a language people respond to consciously and subconsciously, giving real emotional experiences. 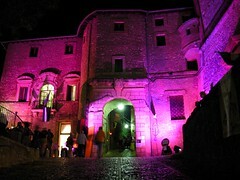 The public will become an active part of the event by setting the colours and amplifying the castle’s identity. The installation is created by a group of IT graduates who are members of Mediars: Alvaro Patacchiola, Alessandro Martellucci, Luca Martellucci and Tommy Gentile. The initiative is funded by the Lazio Regional Government and carried out in collaboration with the Consigliano council. Martellucci and Gentile won scholarships funded by the Rieti Provincial Government and the Fondazione Varrone. The six-month scholarships for the 2005-06 academic year were granted as part of the Quartieri della Memoria (Neighborhoods of Memory) a oral history interactive installation set up by UCLA for the City of Rieti. The oral history was collected by communications science graduate Susanna Gnan. The huge number of visitors who come to Consigliano for the historic re-enactment will enable Mediars to test new mobile-telephone software that enables visitors to access local cultural and tourist information. It is an application in the initial stages of development that could be used regularly in the future at cultural tourism events.